THROUGH his imagery Rinas revives scenes that like old photographs have become forgotten, faded, scratched, mould stained, and deteriorated. Symbolically, to Rinas the old buildings represent the past, slowly-fading as do his reds. Renewal comes from loving the very layers of time that have caused the flaking, fading color and thick texture shown on his surfaces. His paintings contain complex discourses between dark and light, veristic and abstract, hidden and overt, subtle and literal, imagined and real. Thematically Rinas teases his viewers with imagery relating to architecture, shipping, history and his objects seem to be stepping out a time machine to engage with the present. So that, they appear asynchronous, as if the figures are from a dream as do the red and white columnar forms in Hidden, oil on canvas painting. Moreover, there is a distinct disjunction taking place when coming in contact with Rinas’ abstract expanses punctuated by veristic touches as seen in Smokescreen. The miniature ship naturalistically painted emits smoke from its stacks and is surrounded by smaller craft belonging to an Armada entering New York harbor. Rinas with his practiced eye renders the vessels so naturalistically as to create a tromp l’oeil effect, but this type of verism is part of his Hellenic background. It was the great Classical painter Zeuxis who is described in documents as having painted a cluster of grapes so illusionistically so as to cause birds to peck at them. Rather than rendering objects in terms of line only, Zeuxis used chiaroscuro to model his subjects rendering them voluminous as if receding in space. But it is not only Rinas’ skills with a brush that distinguishes him from others of his time rather it is his multi-layered, riveting ideas as presented in his paintings. There is a wealth of references present that accounts for complex readings of his works. Time is a meaningful leitmotif that appears as layers of plaster, paper, paint, that are worn, pealing, tattered, in works such as Smokescreen, Palimpsest, Sunburst or Transparent. 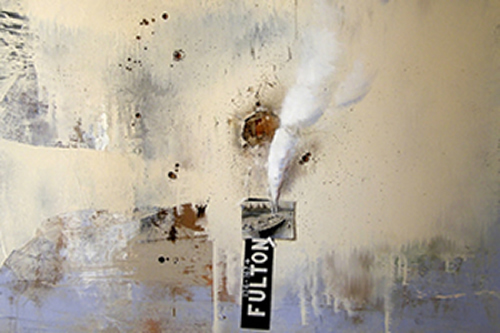 In such works as Smokescreen, and Palimpsest he uses street signs that have been partially covered over or erased making it necessary for his viewer to tease out possible readings. So that, even though we can only see part of the first and the last two letters of the street name because the center part of the sign is covered by a picture of a ship we can infer its reading as Beekman Street. From this address it is possible to see the Brooklyn Bridge, also depicted in photographic grisaille, and the harbor with ships entering and leaving. As sign, text is an abstraction because it is based on a symbolic system that when used in painting results in conceptual works. Time is another important leitmotif throughout Rinas’ works as seen in his many layered distressed surfaces but also seen as crumbling buildings, cracking surfaces, and drilled holes in old walls. The ideas of deterioration and layering can be read as history, as the passage of time but not in a negative way, rather like treasures buried and about to be re-discovered. Clearly, only a virtuoso could create such paradoxical complexity and do it so well. Soft peach tones engage pale yellows and sanguine rusts blend with earthy browns to produce symphonies of tones that at times are soft and at others vibrate with energy.